Turtle Point Press, 9781933527864, 318pp. The year is 2024. Climate change has altered the world's wave patterns. Drones crisscross the sky, cars drive themselves, and surfing is a new Olympic sport. Mafuri Long, UCSD marine biology grad, champion surfer, and only female to dominate a record eighty-foot wave, still has something to prove. Having achieved Internet fame, along with sponsorship from Google and Nike, she's intent on winning Olympic gold. But when her father, a clinically depressed former Navy captain and widower, learns that his beloved supercarrier, the USS Hillary Rodham Clinton, is to be sunk, he draws Mafuri into a powerful undertow. Conflicts compound as Mafuri's personal life comes undone via social media, and a vicious Aussie competitor levels bogus doping charges against her. Mafuri forms an unlikely friendship with an awkward teen, a Ferrari-driving professional gamer who will prove to be her support and ballast. Authentic, brutal, and at times funny, Mafuri lays it all out in a sprightly, hot-wired voice. 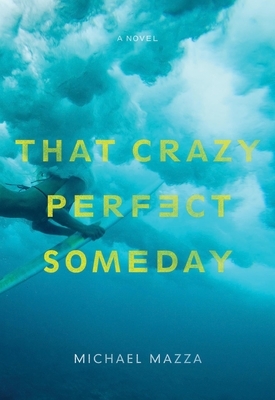 From San Diego to Sydney, Key West, and Manila, That Crazy Perfect Someday goes beyond the sports/surf clich to explore the depths of sorrow and hope, yearning and family bonds, and the bootstrap power of a bold young woman climbing back into the light. Michael Mazza is a fiction writer living in the San Francisco Bay Area. His stories have appeared in Other Voices, WORDS, Blue Mesa Review, TINGE, and ZYZZYVA. He is best known as an internationally acclaimed art and creative director working in the advertising industry. Along with being named National Creative All-Star by Adweek, his work appears in the Permanent Collection of the Library of Congress. He has lectured throughout the country and abroad, most notably at the Great Hall of the People in Beijing. He has attended the Iowa Summer Writers' Workshop, the Stanford Creative Writing workshop, and the Wharton School Executive Education MBA program.